I’d always liked Assaggio Ristorante, in fact it had always been one of my Adelaide favourites, serving consistently good food under chef Camillo Crugnale. I’d often recommended it to others. Recently, in its tenth year, a new chef (Nick Tadija) arrives, with Camillo leaving to take charge at The Stag’s new restaurant, Vardon. Being a big Camillo fan, I chose to check out Vardon first, so now it was time to see how things might have changed at Assaggio. I was really hoping that it was still serving quality food. Assaggio means ‘taste’ or ‘tasting’ and it’s located on King William Road in up-market Hyde Park (not to be confused with its more casual sister restaurant Assaggio Café in Campbelltown). It’s always been quite stylish and had a nice feel about it. Gone now is all of the red – the colours are a lot more neutral. The menu is modern Italian based on local and seasonal produce and the idea is to keep it simple, “… allowing the raw ingredients to speak for themselves”. Nick Tadija is originally an Adelaide boy but has recently spent some time in London, in Michelin Star restaurants. I am relieved to say that the food is very good. My dining partner and I decided that we’d share everything – 2 entrees and 2 mains. For entrees we chose the Arancini with cherry wood smoked barramundi and blood orange (the smoked fish made for really tasty arancini) and the Calamari Fritti with charred baby gem lettuce, squid ink aioli and pickled lemon. A really nicely done dish, and very pretty! 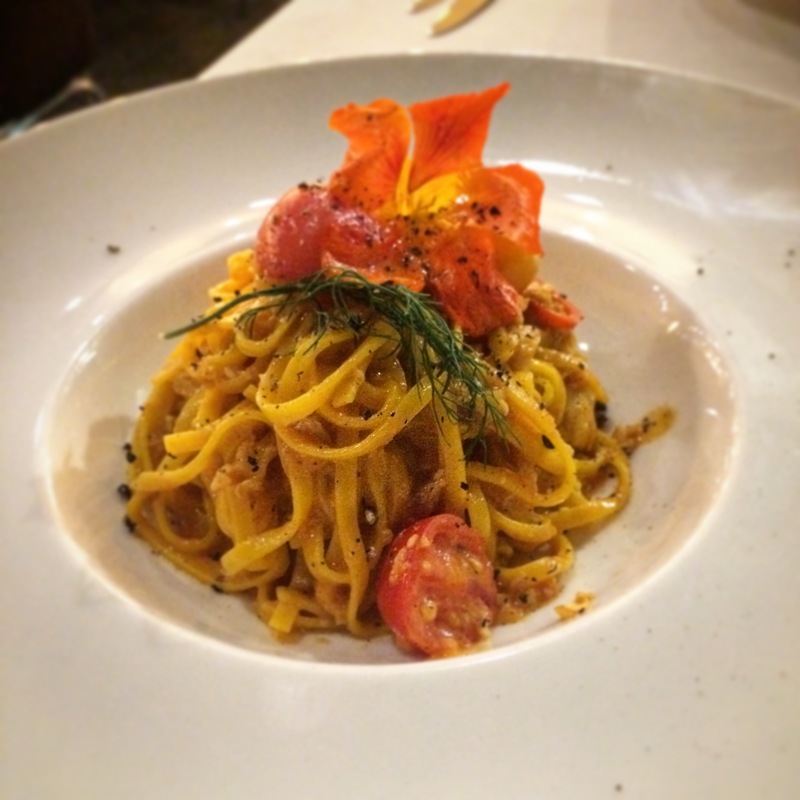 We’re both crab pasta fanatics so we simply HAD to order the Chitarra Granchio – saffron chitarra (all of the pasta is made in-house) with lobster bisque, blue swimmer crab meat, heirloom cherry tomato, fresh dill and lemon oil. A mighty fine dish, and it was nice that they served it to us in two separate bowls. Our other main was absolutely splendiferous – the Lamb Rump, salt baked turnip, spring pea, burnt onion, fresh curd and lamb sauce. Great to see turnip on a menu and the lamb was tender, succulent and pink – a truly great dish. As a side, we had the Asparagus dressed in lemon oil. We loved them – cooked perfectly, and not at all oily. I have to say, the service was a little inconsistent – our main waiter was very, very friendly and accommodating but the woman who delivered food to our table a couple of times did so without saying a word to us – just put the plates down and walked away. We thought that a little odd. The other thing we found was that there were probably a few too many people crammed into the space that particular night. There were a couple of big groups in, but I’m hoping it’s not like that every night as it gave it more of a noisy, clangy café feel rather than a nice restaurant. Regardless, we had a great night and really enjoyed the food. I’m happy to say I’ll be more than happy to go again and I remain confident in recommending Assaggio Ristorante to others.